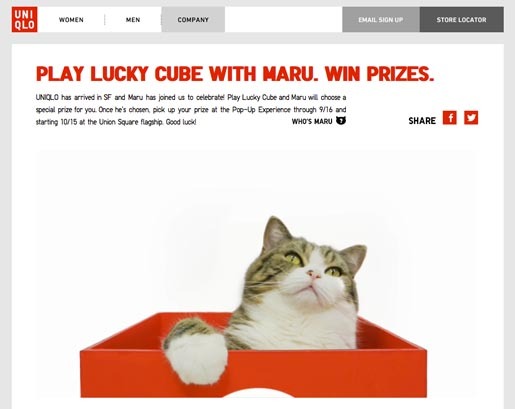 Uniqlo is promoting the launch of its flagship store in San Francisco with “Lucky Cube With Maru”, an interactive site starring the YouTube superstar cat from Japan. San Francisco residents are able to log in with Facebook and watch on as Maru chooses their prize from one of four cubes. Prizes can be picked up from a Uniqlo SF Pop-Up immediately or from SF flagship store when it opens in October.